The 100 finale is already here. In "Blood Must Have Blood, Part Two," the battle between the Sky People and the Mountain Men hits the peak of its crescendo in epic fashion. With all hope lost, Clarke, Octavia, Bellamy, Jasper and Monty have to find a way to save their people. What sacrifices will they have to make along the way? 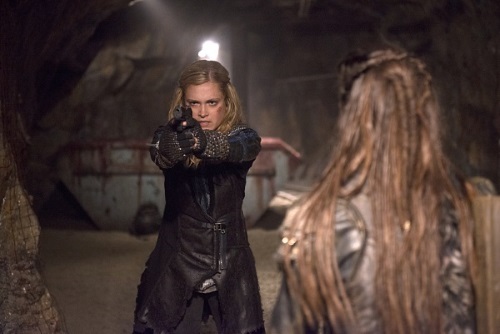 BuddyTV spoke with Executive Producer and Creator Jason Rothenberg to find out how Clarke moves on after Lexa's betrayal, whether there's any hope in this world, Jaha's quest for the City of Light and the difficult decision facing Clarke. BuddyTV: Clarke at the end of "Blood Must Have Blood, Part One," she was left just standing there. How is she able to take that disappointment and forge forward with her people in danger. Rothenberg: That moment is designed obviously to be the lowest of the low. The low point where everything she had going into the episode and into the ultimate battle for Mount Weather was taken away from her including the woman she had been falling for romantically. Everything is taken away from her in that moment. And her people are left to die and she has no way in and when we find her that's where she still is. She doesn't know how she's going to do this. She knows that door's not an option so she heads to the door she knows about. That's where she finds Octavia and of course things transpire from there. I think it's always darkest before the dawn, but I guess in The 100 it can always get darker. [Laughs] And that's where this episode begins. Continue to read full interview at BuddyTV.